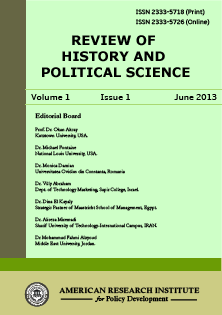 Review of History and Political Science (RHPS) is a peer-reviewed international journal published by American Research Institute for Policy Development. The RHPS is unique in its range and variety, packing its pages with stimulating articles and extensive book reviews. The journal balances its broad chronological coverage with a wide geographical spread of articles featuring contributions from social, political, cultural, economic and ecclesiastical historians. The journal also welcomes contributions drawn from all fields of political science (including political theory, political behavior, public policy and international relations). Papers accepted for publication are double-blind refereed to ensure academic integrity. Each paper published in Review of History and Political Science is assigned a DOI®number, which appears beneath the author's affiliation in the published paper. Click HERE to know what is DOI (Digital Object Identifier)? Click HERE to retrieve Digital Object Identifiers (DOIs) for journal articles, books, and chapters. Dr. Kwasi Sarfo, Department of History and Political Science, York College of Pennsylvania, USA. Dr. Christie L. Richardson, Savannah State University, USA. Prof. Natalia Skobelina, Volgograd State Technical University, Russia. Dr. Daniel Flaut, “Ovidius” University of Constanta, Romania. Dr. Fatih DUMAN, Hitit University, Turkey. Dr. HAKAN KÖNİ, Çankırı Karatekin University, Turkey. Dr. John Koskey Chang’ach, Moi University, Eldoret, Kenya. Dr. Kittisak Jermsittiparsert, Kasetsart University, Thailand. Dr. Reza Ekhtiari Amiri, University of Mazandaran, Iran. Dr. Kaustav Chakrabarti, Dept. of History, Fakir Chand College, India.